With that being said, your homepage is the most important part of your website because it gives off the first impression of your business. It is typically the most visited page on your website. It is the easiest remembered URL. It shares your mission, values, and goals – and should quickly communicate to your audience how your product/service addresses their needs. A variety of different traffic types come to your homepage, so it needs to cater to every one of your buyer personas. That’s a lot to ask of one page! To make sure you have the best homepage possible, with a lasting impression, we’ve outlined 9 steps that need to be taken. Go through these steps and make sure you have completed each of them. What is your website about? How can you educate your audience? Aim to get users beyond the homepage. Use measurable goals to track performance. Incorporate calls-to-action to show the next steps. Don’t let a user self-direct. Take them down the path that helps them make an informed decision. Homepage content is your business value proposition. Focus on one primary, long-tailed keyword. What words/phrases is your audience searching for to find your product or service? Use headlines and bullet points. Make your content easy to scan. Split content into columns – no more than 4. Have whitespace, so you don’t overwhelm the visitor with content. Use internal links to help guide through the website. With big images, layer them with text as a call-to-action. 3. Optimize the page for Search Engines (SEO). Make the page unique by using one main keyword that describes your business. Meta description – a CTA (call-to-action), up to 150 characters. 4. Create an eye-catching header. Add courtesy links in top right for quick navigation. Add a login link – if needed. Have a consistent header throughout the whole website. Make it big enough so that it can be seen from 5 feet away. Use a clear font for easy reading. Keep it consistent across the website. Have descriptive short menu headers. No more than 8 menu headers going across. 5 or 6 is an ideal number. Again, keep it simple and clear. You have 3-5 seconds to engage the visitor – use CTAs to attract and engage. Each CTA should appeal to a different visitor type. Not all need to go to landing pages. Some can point to blog posts, for example. Incorporate A/B testing – use 2 different CTAs and test them against each to see which receives more clicks. Look at your analytics to see which CTAs are the most effective. Add a CTA to join your social networks – assuming you’re active in social media. Add follow and share icons in header and footer. Be descriptive and show reason and value to join. Include company legal name and copyright year. Add contact information and important links. Users often use the footer as an active site map. Keep it consistent throughout the website. 9. Continuously test your homepage. What can be added or adjusted? Our last overall recommendation: look at the data and adjust. Using a tool like Databox (We are a proud Databox Partner and affiliate, we receive commission on purchases made through links on this page. ), you can set up monthly marketing dashboards, which allow you to evaluate your most important KPIs -- across multiple platforms -- in a single data dashboard. Add annotations, notes and send a live link of your data report to your marketing department, client or C-Suite, highlighting your successful homepage optimization. 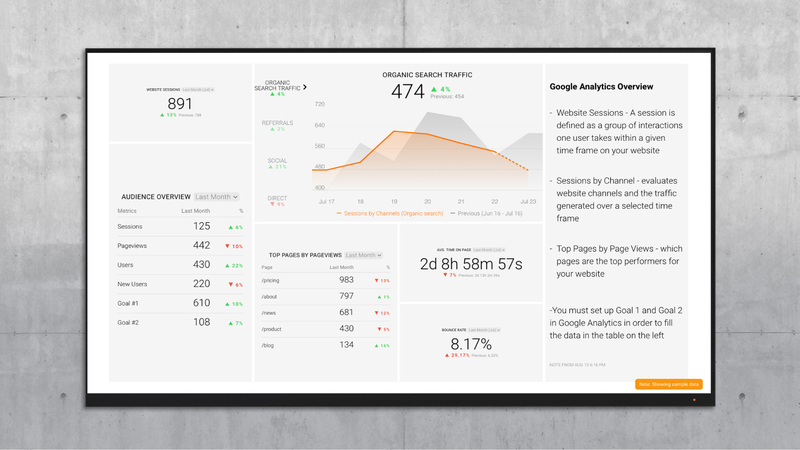 Use the Google Analytics Website Performance dashboard to benchmark your website data now, and check back monthly to see how your optimizations are working for you. Make your website remarkable and stand out against the crowd by implementing these steps, if you haven’t already. Make that first impression a lasting impression that will continuously bring people back to your site, and hopefully turn the visitors into leads and customers.